In the book Divergent by Veronica Roth, society is divided up into five factions. They were formed at the beginning of the great peace. The faction system persists because everyone is afraid of what might happen if it didn't... war. The society's motto is Faction before blood. When you turn 16, you are given the choice to stay with the faction you were born into or leave them to live the rest of your life with another. Those who switch factions are viewed as traitors. In most cases your own family won't even visit you or have anything to do with you ever again if you switch. Those who blamed aggression formed Amity. Those who blamed ignorance formed Erudite. Those who blamed duplicity created Candor. Those who blamed selfishness made Abnegation. And those who blamed cowardice were the Dauntless. If you would like to know more about each of the five Divergent factions, feel free to click the photos representing each faction above. On each online page, you will be able to find facts about each one from the books, the symbols for each faction, the manifestos and more! 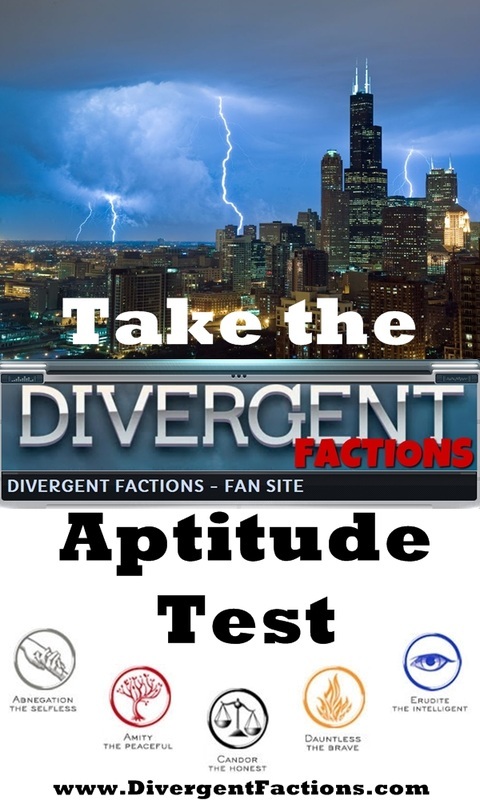 Would You Like to Take the Divergent Factions Aptitude Test? If you would like to take a quiz to determine which of the five divergent factions you are most suited for, choose the banner on the right. The Divergent Factions aptitude test is patterned after the book series by Veronica Roth (and upcoming movie), but will take a step further to find out what group you truly belong in. Remember, your quiz results don't necessarily mean you have to join the faction that your aptitude test says you are most like. Make your choice wisely. Faction before blood.